Miniature watercolor, ca. 1780. Artist unknown. Detail from an image on the National Maritime Museum, Greenwich, London website, and used for non-commercial use under the terms of the Creative Commons Attribution-Non-Commercial-ShareAlike (CC BY-NC-SA) licence. An indirect descendant of Sir Francis Drake (d. 1596), Francis William is often confused with his younger brother, also a naval officer whose death occurred around the same time. Drake joined the Royal Navy and commanded several ships including the Fowey before 1750. 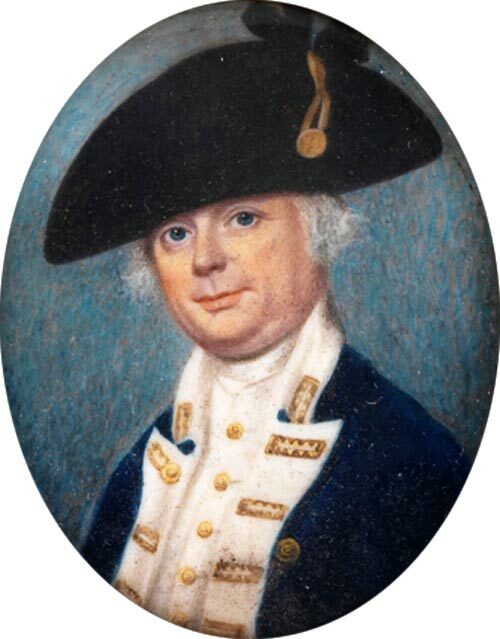 In 1750, Drake served as the de facto Governor of Newfoundland under Commodore Rodney, senior naval officer in 1750 and 1751, and was promoted to the full position in 1752. In 1750, the courts of oyer and terminer were established to hear criminal cases. Drake appointed commissioners for regular trials, and was allowed to pardon all offenders except intentional murderers. He also had the power to permit executions, but referred most to England. Drake served during the Seven Years War and the American Revolutionary War. He was promoted Vice-Admiral of the Blue in 1780 and Vice-Admiral of the Red in 1757. He was married to a minor, the daughter of the member of Parliament for Guilford, in 1788 and died that year, or early 1789.